‘Castles in the Sky’ Review: In a word? Delightful. As a kid, I had a routine when I went to bed. The routine was that I didn’t. Instead, I’d always sneak in a little bit more of enjoyment into my day before tiredness or my parents caught me. This could’ve been grinding out a few more levels in Final Fantasy on my GameBoy, checking in on my Pokemon at the Daycare Center, or cramming in a couple more chapters in a good book. I mostly did this to compensate for the fact that I never really had someone read me a story before bed. I had to fill that void on my own. After player Castles in the Sky, I now have an inkling as to how that feels, and now I feel like I’ve been missing out. Castles in the Sky is essentially a storybook in game form. People always say imitation is the sincerest form of flattery and that is especially true here. Apart from the lack of narration from a parental figure and the presence of a beautiful musical score, Castles in the Sky is a storybook in the truest sense of the word. Everything down to the visuals, writing, and length match up perfectly to any book found in a toddler’s room. That’s not a bad thing, either. It’s great, even. It’s nice to see a game, as simplistic as it is, with no ulterior motive. It just wants to, as the internet would likely put it, hit you right in the feels. The story itself is not truly spectacular, as most storybooks are. It’s ultimately all about the world as whole falling asleep at night. You play a boy who, upon grabbing onto a balloon near the grounds, starts to ascend to the moon. Along the way, you’ll hear little stories about what other people in the world are doing at the same time. It’s not exactly groundbreaking, but it gets the job done. The gameplay, on that same token, plays like a much easier Doodle Jump, as the game’s precocious young protagonist jumps from cloud to cloud until he can go no further. Along the way you may find little balls that you can collect. They serve no real purpose, but they’re oddly fun to go and grab. Beyond that, it’s no frills platforming. Tying it all together is the cute-as-all-hell pixel art and the beautiful piano score. They both share the simplicity of the entire game and are just a delight to look at/listen to. If it seems like there isn’t much to talk about, that’s because there isn’t. Just like any good storybook, Castles in the Sky is short. A generous estimate puts it in at around 10 minutes, tops. However, the extremely low asking price of a buck fifty makes me feel compelled to recommend it. The game may not offer much in substance, but it definitely makes up for it in heart, and I can appreciate that. 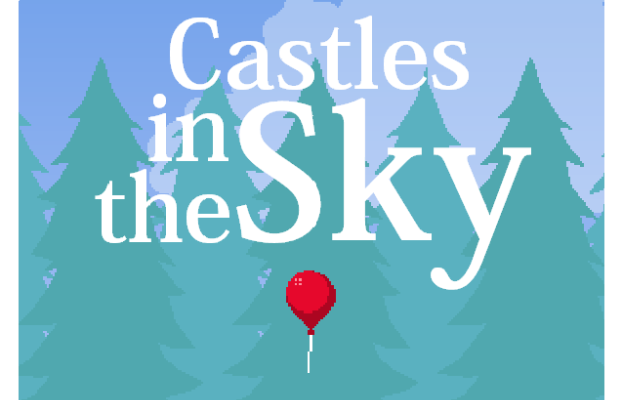 Castles in the Sky was developed and published by The Tall Trees. A PC copy was provided by the publisher for review purposes.